Search our comprehensive archive for detailed documentation of our work including evaluations, studies, journal articles, publications and more. Click this link to see the full overview of this project via the IMPACT section of VillageReach web site. In 2010, VillageReach launched a national expansion of the DLS, currently serving more than 500 health centers and a population of over 8 million in five provinces.The DLS applies a comprehensive strategy providing: a streamlined distribution process, improved data collection and management through a locally appropriate information management system build on the OpenLMIS platform, and active and ongoing supportive supervision and training. Click this link to see the full overview of this project via the OUR WORK section of the VillageReach web site. PRESS RELASE: SEATTLE (February 4, 2013) —The Bill & Melinda Gates Foundation today announced the winner of the second Gates Vaccine Innovation Award. People that Deliver is a global partnership whose mission is to build global and national capacity to implement evidence-based approaches to plan, finance, develop, support and retain the national workforces needed for the effective, efficient and sustainable management of health supply chains. VillageReach is a member of the Advocacy & Knowledge Management and Research Working Groups, helping to promote the need for qualified supply chain professionals in public health systems and ensure that resources and best practices are shared across countries. 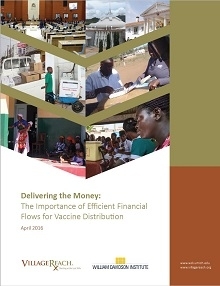 This policy paper from VillageReach and the William Davidson Institute (WDI) explores the impact of adequate and reliable flow of funding all the way to the point of care as a critical component of effective immunization supply chains (iSC). Vaccine programs face inadequate funding and bottlenecks in accessing funding, both of which contribute significantly to iSC underperformance and program delays. This paper illuminates the root causes of funding flow challenges and highlights case studies that offer promising tools and approaches for improvement. This paper explores the Dedicated Logistics System in Mozambique and how a system design approach helps to optimize the supply chain, using tools like modeling and electronic LMIS to generate and critically examine evidence each step of the way. This approach can be applied to all activities undertaken to deliver commodities to the last mile. Supply chain managers can use system design to create blueprints for optimization and also master the skills needed to be agile and adapt the blueprints as evidence about their efficiency and effectiveness is gathered. The following key messages were developed with input from colleagues at the WHO/UNICEF Supply Chain Hub, John Snow, Inc., VillageReach, the Bill & Melinda Gates Foundation, the Clinton Health Access Initiative, and Gavi, the Vaccine Alliance and coordinated by PATH. They are intended to unite partners and stakeholders in a common language around immunization and health supply chain strengthening and may be used freely by all partners when communicating about immunization supply chains issues and solutions. 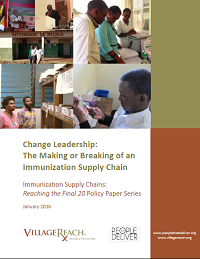 Change leadership and effective management are critical ingredients for modernizing immunization supply chains (iSCs) to withstand current and future pressures and ensure all children have access to vaccines. 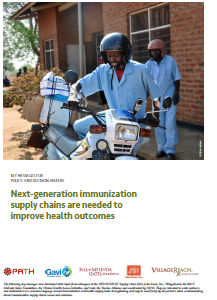 This paper, co-authored with Andrew Brown and People that Deliver, explores the necessary leadership qualities of people involved in the transition to next-generation immunization supply chains, and provides recommendations and resources to help ensure these qualities can be fostered and developed. Governments and their partners are acutely aware of the need for innovative ways to reduce the data burden on health workers. With support from the US Agency for International Development-funded Systems for Improved Access to Pharmaceuticals and Services (SIAPS) Program, VillageReach conducted a review of data management and use practices, particularly with respect to pharmaceuticals, in Malawi and Swaziland to better define and quantify the data burden facing health workers. 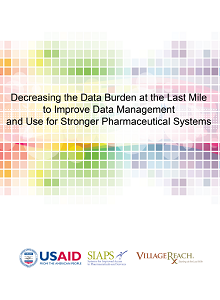 This brief provides both context for and an articulation of the data burden seen within health systems in LMICs. 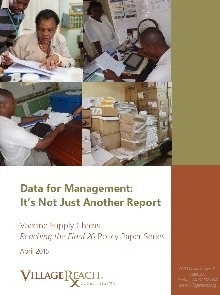 It also provides recommendations for ways that ministries of health, donors, and implementing partners can rethink their approach to data management to improve health service delivery. O mais novo edição do Últimos 20 já chegou! Este edição enfoca no uso de dados para o gestão e a importância de obter dados de qualidade. The fourth in this series, this paper addresses the many challenges in data collection and quality, and discusses the global shift towards data visualization and utilization for improved decision making. The informed push system for vaccines in Mozambique uses dedicated logisticians for improved data collection; introduced an information system built on the OpenLMIS platform for enhanced data visualization and analytics; and systematized processes for better data utilization. These changes have led to a more efficient supply chain and higher vaccine coverage rates. Read more about this as well as other global innovations in this paper. O desafio de fazer chegar vacinas até aos últimos 20. O Boletim de Projecto Últimos 20 em Moçambique já está disponível—novidades de nosso trabalho na cadeia de abastecimento de vacinas em Moçambique. This report assesses the impact of a weak energy sector on the health system in rural communities and analyzes social business opportunities as a way to strengthen this sector. Social Business Development Opportunities: Transport Sector: This report highlights the effects of an unreliable transport sector on the health system in rural communities and analyzes social business opportunities as a way to strengthen this sector. Final 20 Policy Paper 3 - System Design: Repair or Replace? Part Three of the Reaching the Final 20 Policy Paper Series. 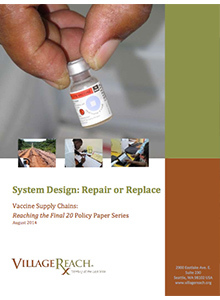 A new policy paper on the vaccine supply chain. This paper considers the broader concept of system design and how all components of a supply chain can fit together to be most efficient. This is the third paper in our Final 20 series that looks at the different components of the supply chain, addresses the challenges faced at the last mile for distribution and presents examples of innovative approaches to address those challenges. Part Two of Reaching the Final 20 Policy Paper Series. 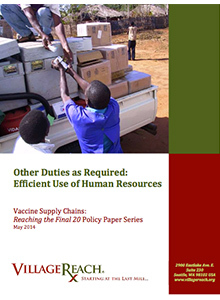 This second paper in the series focuses on the role of human resources and the specific challenges facing individuals within the health system to adequately address the needs of vaccine supply chains, particularly in low resource communities. The Final 20 series looks at the different components of the supply chain, addresses the challenges faced at the last mile for distribution and presents examples of innovative approaches to address those challenges. Newsletter covering our Final 20 work in Mozambique. (Portuguese only) O desafio de fazer chegar vacinas até aos últimos 20. This paper describes the challenges of effecting improvements in healthcare distribution systems and VillageReach’s approach, streamlining logistics, applying digital information systems, and leveraging the private sector to improve community infrastructure capacity. Through work with the United Nations Commission on Life-Saving Commodities, VillageReach has taken the lead on developing this Private Sector Engagement Guidance Document. 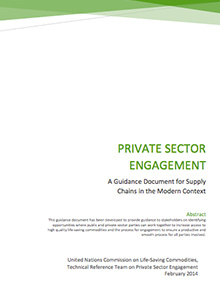 Through a collaborative process, it has been developed to provide guidance to stakeholders on identifying opportunities where public and private sector parties can work together to increase access to high quality life-saving commodities and the process for engagement to ensure a productive and smooth process for all parties involved. Download the Guide Here. Part One of Reaching the Final 20 Policy Paper Series. This first paper in the series documents the challenges of the cold chain at the last mile of delivery and providing examples of new innovations and approaches to improve cold chain monitoring and maintenance. The Final 20 series looks at the different components of the supply chain, addresses the challenges faced at the last mile for distribution and presents examples of innovative approaches to address those challenges. 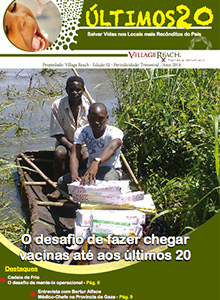 The first VillageReach/Mozambique newsletter provides an overview of VillageReach, our Final 20 project, and highlights some of our great colleagues that ensure vaccines get delivered to the last mile. (in Portugese only) O primeiro boletim de VillageReach/Moçambique já está disponível. Ele fornece uma visão geral de VillageReach, o nosso projecto Final 20, e destaca alguns dos nossos grandes colegas que garantam vacinas são entregues nos locais mais recônditos do pais. 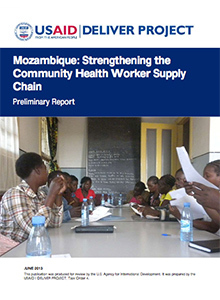 A report of supply chain strengthening interventions focused on community health workers in Mozambique, covering antimalarial drugs, rapid diagnostic tests, male condoms, and essential medicines for a variety of treatments. 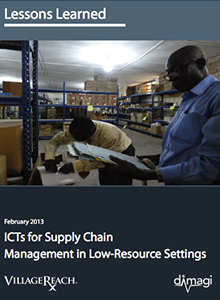 A VillageReach co-authored report discusses a variety of open-source ICTs for supply chains in low-resource settings from light mobile applications to simple information systems. 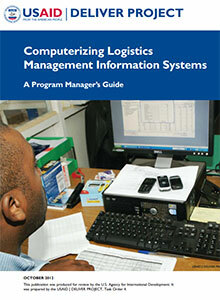 A technical guide of best practices for the development of digital LMIS platforms. 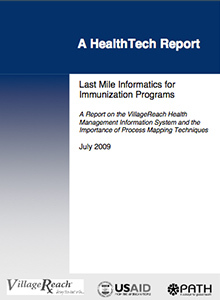 This report was prepared in conjunction with PATH for USAID to explain the role of information technology in global health using the VillageReach management information system (vrMIS) as a case study. We have more than doubled vaccination sessions, which is among the key indicators of health district performance. While in 2016 there were less than 100 vaccination sessions completed, in 2017 we achieved over 200. These include both fixed and advanced strategies, where health workers organize strategies to find even one child who is not coming to the health center. What are the biggest challenges to ensuring that vaccine supply chains can cope with increased demand? 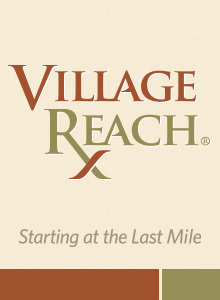 At VillageReach, proximity is multi-dimensional. It must mean nearness in relationship as well as nearness in space and time. Shared ownership allows organizations to truly see and represent the individuals they serve. World Immunization Week is a perfect time to reflect on global priorities and our commitment to the Global Vaccine Action Plan (GVAP). This framework guides the work of organizations around the world to reach every child with life-saving vaccines. It is also a way to measure our collective success. Accurately measuring our progress against GVAP targets is central to moving the needle globally, but we need to be confident in the data. As someone who has dedicated his life to public health, I am thrilled to see Africa’s leaders making a bold commitment in support of immunization. The African Union endorsement of the Addis Declaration on Immunization (ADI) demonstrates that vaccines, and the proper health systems to deliver them, play a significant role in the future of our continent. Measles and many other diseases preventable by vaccination have a devastating potential. Even a few years ago, rural communities had a saying: to know how many children you have in your household, wait for the measles. Measles epidemics have decimated children in times past. This was the case of the Mankanza territory in the province of Equateur, located 220km from the provincial capital, Mbandaka, and accessible only by water. Many, many children were buried because the measles vaccine had not yet come to their communities until 1996. The few survivors can still recall the impact of these measles epidemics. Even with sub-optimal immunization coverage, once the vaccine came, no epidemics occurred. Comme quelqu’un qui a consacré sa vie à la santé publique, je suis ravie que les dirigeants Africains se soient engagé ardemment à soutenir la vaccination. L’adhésion de l’Union Africaine à la Déclaration d’Addis-Abeba sur la vaccination démontre que les systèmes de santé adéquats pour la livraison des vaccins jouent un rôle important dans l’avenir de notre continent. Last week, the Reproductive Health Supplies Coalition (RHSC) brought together hundreds of the top minds in global reproductive health issues at the Coalition’s 17th Annual Meeting. This meeting provided a forum for discussing the many triumphs and continuing challenges of reaching 120 million additional women with reproductive health services by the year 2020. Access to reproductive health commodities allows women to decide if and when to have children. This ability is not only a human right, it can be a life or death situation for many women and young girls. Increasing access to reproductive health is also one of the most effective and cost-efficient ways to reduce infant and maternal deaths. As an active member of the RHSC’s System Strengthening Working Group, VillageReach eagerly engaged in this week of conversation and idea exchange. Many of the central themes reflect the work of VillageReach, allowing us to bring our experience and expertise to the conversation while learning and growing from the experiences of our partners. Why is the Last Mile so critical to the supply chain? As a global health innovator, VillageReach invests great time and effort in exploring how new technologies can be applied to address existing heath systems challenges. Often, this means considering how health system improvements can be leveraged to solve more than one problem at a time. Take, for instance, the emerging Zika virus threat: while VillageReach does not coordinate emergency disease response, our work improving routine transport of medical commodities could be used to strengthen emergency efforts. Similarly, emerging and innovative technologies, such as unmanned aerial vehicles (UAVs, commonly referred to as drones) could add to this comprehensive approach to healthcare improvement. Working with new partners and new problems allows us to expand our thinking around these innovative technologies. We’ve recently returned from a co-creation workshop convened by USAID where donors, technology providers and global health agencies gathered to discuss the application and potential impact of UAVs in the response to Zika and other emerging threats. While we did hear about proposed strategies for targeting specific disease vectors (mosquitos), one common thread ran through the discussions with which VillageReach is quite familiar: the essential role of reliable routine systems in supporting emergency disease response. 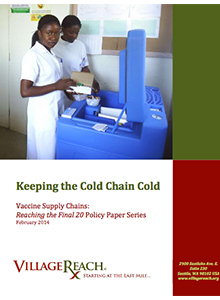 Immunization supply chains have not changed much since they were first conceived in the 1970’s. Most ad-hoc efforts to improve these systems, like increasing storage or transportation capacity, have not been effective in dealing with modern day demands on these systems. It is estimated that between 2010 and 2020, immunization services will require twice the storage and transport capacity to manage four times the vaccines. With this unprecedented expansion, workers at all levels of the supply chain feel the burden of supply chain inefficiencies. This extra burden, particularly at the service delivery points, results in low vaccine coverage rates at the last mile. Supply chain managers are beginning to challenge the status quo of their supply chains and embrace innovative approaches for improved performance. VillageReach, along with CIDRZ and the Zambian Expanded Programme on Immunization (EPI), held a workshop last week in Lusaka to take a holistic look at immunization supply chain (iSC) in Zambia. This workshop brought together national EPI programs managers, decision makers and key stakeholders to identify potential options to make the iSC more efficient. Often when we talk about methods of delivery in low-resource environments, we are referring to simple solutions. Health commodities arrive at rural clinics on trucks, by bicycle or motorbike, by foot, and sometimes even by boat or canoe. These traditional delivery methods are often faced with simple, but insurmountable barriers. Roads are washed out or are in poor repair. Vehicles are not properly maintained or require expensive fuels. Routes pass through potentially dangerous areas with threatening wildlife. Trying to find new, innovative solutions for these problems has lead VillageReach to UAVs – unmanned aerial vehicles. Last week, I presented at the first meeting of the Final Mile Logistics Working Group, providing an overview of UAVs and the potential they have for filling the delivery gap in global development. This post is part of the #ProtectingKids story roundup. Read all the stories here. Over a four-year period, the Mozambique government, supported by Gavi and its donors will spend over $19M to purchase the rotavirus vaccine. At roughly $3.50 per dose, it is one of the most expensive vaccines the country has ever helped purchase. To protect the investment in providing rotavirus and other vaccines for Mozambique’s children, we must ensure they are available when families visit health centers. 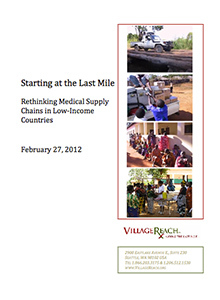 BLOG: VillageReach commitment to eliminate stockouts via the Reproductive Health Supplies Coalition take stock campaign. BLOG: A summary of our experience and key learning from IWG mHealth Capacity Building Workshop 2015, Nairobi. 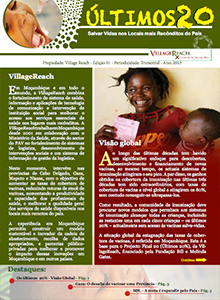 BLOG: This week, the team of VillageReach is participating in the “Jornadas de Saude” (Mozambique health fair). We attended today a very impactful presentation on successes and challenges on the introduction of multiple vaccines into the EPI program in countries with limited resources. 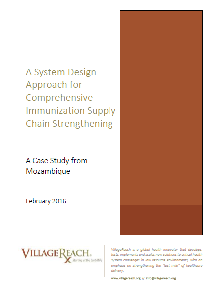 How VillageReach used HERMES modeling to prepare for the introduction of Rotavirus in Mozambique. Using mobile technology is a key component in USAID’s strategy to end preventable maternal and child deaths, called Acting on the Call . According to USAID, by using mobile technology to accelerate our rate of progress, we can save the lives of 15 million children and almost 600,000 women by 2020. For the past four days, I’ve had the opportunity to explore how other countries and organizations are approaching this goal at the Africa Regional Meeting on Digital Health for Overcoming Barriers to Ending Preventable Child and Maternal Deaths and Achieving Universal Health Coverage. According to USAID, by using mobile technology to accelerate our rate of progress, we can save the lives of 15 million children and almost 600,000 women by 2020. It seems like a stretch—using Legos to find efficiencies in a vaccine supply chain. But that was the concept we worked with last week in Mozambique with representatives from both national and provincial level Ministry of Health, UNICEF, WHO, and VillageReach, led by the HERMES logistics team taking us through the use of the HERMES modeling tool. 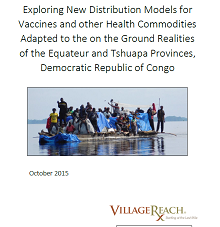 I’m excited about this work because at VillageReach we believe that more rigorous evaluation of supply chain interventions and more transparent dissemination of results is vital to increasing access to medications to those who need them the most. Creating a body of evidence on what works, advocating that evidence-based practices be implemented, and learning from each other’s progress and each other’s challenges, is the best way to make sustainable change. Shopping Around for Vaccine Supply Chains? Try it On.